Just last month we heard that Apple might not launch a folding iPhone until 2020, but we may already have an idea of the form it will take, as the company has published a patent housing some clues. Spotted by Patently Apple and filed with the US Patent and Trademark Office (USPTO), the patent details an electronic device with a flexible display which can be folded in half. This would potentially be achieved using an optically clear flexible adhesive and a shape memory alloy or amorphous metal. More specifically, Liquidmetal is mentioned as a possible material, which would make sense since Apple has long had exclusive rights to the amorphous material in consumer electronics, yet so far has done little with it. The patent also mentions the possible use of a micro-LED display, which is more energy efficient and thinner than OLED, and has previously been rumored for inclusion on an Apple Watch. 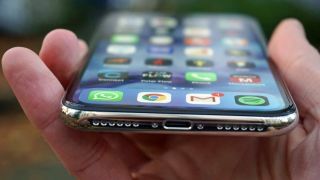 With Apple only just now moving to OLED for the iPhone X we wouldn’t expect another change in technology any time soon, but if a foldable iPhone doesn’t launch before 2020 it’s possible that micro-LED could be used. However, if we really are waiting that long for a folding iPhone then Samsung could have a major head start, as it’s possible that the 'foldable' Galaxy X will launch next year.